The most ancient spiral galaxy discovered to date is revealing its secrets to a team of astronomers at Swinburne University of Technology and The Australian National University (ANU), part of the Australian Research Council Centre of Excellence in All Sky Astrophysics in 3-D (ASTRO 3-D). The galaxy, known as A1689B11, existed 11 billion years in the past, just 2.6 billion years after the Big Bang, when the universe was only one fifth of its present age. It is thus the most ancient spiral galaxy discovered so far. The researchers used a powerful technique that combines gravitational lensing with the cutting-edge instrument the Near-infrared Integral Field Spectrograph (NIFS) on the Gemini North telescope in Hawai'i to verify the vintage and spiral nature of this galaxy. NIFS is Australia's first Gemini instrument that was designed and built by the late Peter McGregor at The ANU. Gravitational lenses are nature's largest telescopes, created by massive clusters composed of thousands of galaxies and dark matter. The cluster bends and magnifies the light of galaxies behind it in a manner similar to an ordinary lens, but on a much larger scale. "This technique allows us to study ancient galaxies in high resolution with unprecedented detail," says Swinburne astronomer Dr Tiantian Yuan, who led the research team. "We are able to look 11 billion years back in time and directly witness the formation of the first, primitive spiral arms of a galaxy." Co-author, Princeton University's Dr Renyue Cen, says: "Studying ancient spirals like A1689B11 is a key to unlocking the mystery of how and when the Hubble sequence emerges. "Spiral galaxies are exceptionally rare in the early universe, and this discovery opens the door to investigating how galaxies transition from highly chaotic, turbulent discs to tranquil, thin discs like those of our own Milky Way galaxy." Dr Yuan says the study shows some surprising features of A1689B11. "This galaxy is forming stars 20 times faster than galaxies today – as fast as other young galaxies of similar masses in the early universe. However, unlike other galaxies of the same epoch, A1689B11 has a very cool and thin disc, rotating calmly with surprisingly little turbulence. 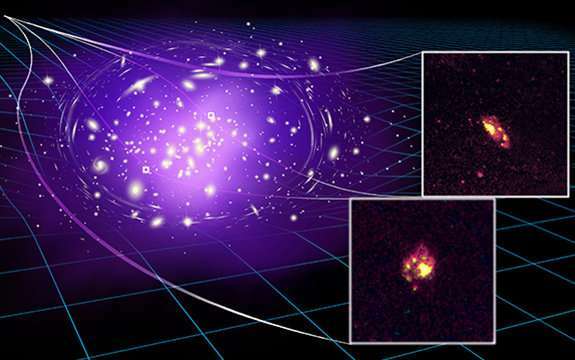 This type of spiral galaxy has never been seen before at this early epoch of the universe." Fascinating. This will give us some pointers to galactic evolution. I'll be interested to see if we can find some more so we can get a better idea of how this important process works. Should have said >It is thus the youngest spiral galaxy observed so far. Yes, it is true, as I have been saying for years. These new observations continue to make insisters supporting the Huge Bang Fantasy look foolish. Projecting math models into fantasy is their big mistake. But the math fairies have gained respect, even though they are little more than intellectual technicians with regard to cosmology. The spiral galaxy is an intermediate stage of galactic growth, not a final stage. As such, it is not surprising to find some with high growth rates, as the growing cores accelerate growth from within naturally. As they mature into giant ellipticals, they seem redder due to tired light losses. And their cores become obscured by dust, leading to faulty models by merger maniacs, convinced of their intellectually convenient math models.